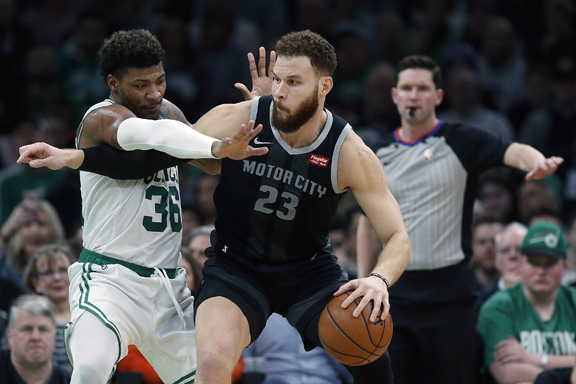 DETROIT — Blake Griffin doesn’t need to jump over any cars to be a hit in the Motor City. A month shy of his 30th birthday, there are fewer above-the-rim highlights but Griffin’s first full season with Detroit has been one of his best. He’s averaging a career-high 26.3 points per game while making strides as a perimeter shooter, and he earned his first All-Star selection since 2015. Most importantly, he’s been able to stay healthy, and although the Pistons still have a losing record, they’re in the playoff race, largely because of Griffin. In July 2017, Griffin agreed to a $171 million, five-year deal with the Clippers, the team that drafted him with the first overall pick in 2009. Less than a year later, he was abruptly traded — from glitzy Los Angeles to a Detroit franchise that hasn’t won a playoff game since 2008.